Chanteur et Guitariste Country US né Charles Pendleton Monroe, le 4 Juillet 1903 à Ohio County (Kentucky). Charlie Monroe est le frère de Bill Monroe. Il est décédé le 27 Septembre 1975. 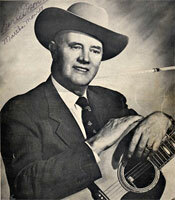 The older brother of Bill Monroe, Charlie joined his younger brother in laying the foundation for bluegrass music. Although they only recorded together for two years, the ripples caused by Charlie and Bill Monroe's collaboration continue to be felt. Raised on a family farm in rural Kentucky, Charlie grew up in a musical home. After learning to sing hymns as children, via the traditional "sacred note" technique, each member of the Monroe family chose a musical instrument. Charlie and his sister Bertha chose guitar, while Birch opted for fiddle and Bill for the mandolin. Although Charlie joined with Birch and Bill to form a band in the mid-1920s, and made his radio debut in 1927, he left with Birch to seek employment in the Midwest after the death of their parents. After temporarily stopping in Detroit, Charlie and Birch went on to work in the oil refineries of Hammond, Whiting, and East Chicago, IN. In 1929, they were joined by Bill, who found a job at a Sinclair refinery. The three reunited Monroe Brothers resumed their musical collaboration, performing at small clubs, dances, and house parties. While performing at a dance in 1932, the Monroes were overheard by Tom Owens, whose band had a feature slot on the radio show WSM Barn Dance. Impressed by their performance, Owens invited the Monroe Brothers to join his group as dancers. The Monroes continued to dance with Owens' troupe for two years. The Monroes got their chance to be musicians again when they were hired to play on WAE in Hammond, IN, and WJKS in Gary, IN. Before long, Charlie and Bill were dreaming of playing music full-time. Their dreams became reality when Texas Crystals, a patent medicine company, offered to sponsor a radio show showcasing their music. When Birch turned down Charlie's invitation to join him on the show, the Monroe Brothers became a duo featuring Charlie and Bill. The duo was so successful that they soon moved to a larger radio station. The show was eventually expanded into a daily event broadcast by WBT in Charlotte, NC. Although sponsorship of Charlie and Bill Monroe's show was dropped by Texas Crystals in 1936, it was quickly picked up by the Crazy Water Crystal Company. In addition to performing daily on the show, the Monroe Brothers performed on the weekly Saturday night show, Crazy Barn Dance. They also appeared on WFPC in Greenville, SC, and WPTF in Raleigh, NC. 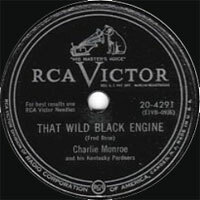 Charlie and Bill Monroe made their recording debut in February 1936, cutting several tracks in a Charlotte, NC, studio that were released on RCA's Bluebird label. A mixture of gospel and secular tunes, the tunes set the standard for bluegrass with their high harmony Vocalss, bass guitar runs, and hard-driving mandolin arrangements. Their partnership, however, was increasingly strained as Bill became frustrated by Charlie's determination to sing lead on every tune. In 1938, the brothers went their separate ways, with Bill forming the Kentuckians, who later became the Blue Grass Boys, and Charlie forming the Kentucky Pardners. Among the many musicians who played with Charlie's band were guitarist and Vocalsist Lester Flatt and mandolin players Red Rector, Curly Seckler, and Ira Louvin. The Kentucky Pardners, who played a mixture of bluegrass and honky tonk-style country music, became one of the most successful tent shows and played continuously throughout the South and Midwest in the 1940s. 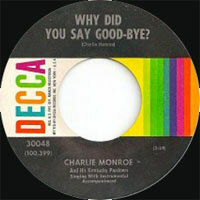 Charlie, who signed a solo contract with RCA Victor in 1946 and moved to Decca in 1950, wrote a large number of tunes, including "It's Only a Phonograph Record," "Who's Calling You Sweetheart Tonight," and "Rubber Neck Blues." Tired of non-stop touring, Monroe retired from music in 1957. Although he intended to remain on his farm, he left Kentucky to work for a lift company in Indiana after his wife was diagnosed with cancer. He remained within the company until his wife's death. Monroe remarried in 1969 and moved to Tennessee, and later to Reidville, NC. Monroe remained inactive until he was persuaded by Jimmy Martin to perform at the Gettysburg Bluegrass Festival in 1972. The response to their performance was so overwhelming that Monroe, often with Martin, continued to perform at similar festivals until 1974, when he was diagnosed with cancer. Monroe died on his farm in Reidville on September 27, 1975, and was buried in the Monroe family plot on Jerusalem Ridge in Rosine, KY.
03/1939 78 t. BLUEBIRD B-8050 (US) . Charlie MONROE'S BOYS - Guided By Love / Is She Praying There? 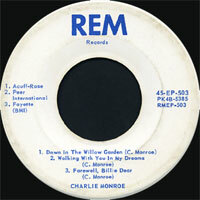 03/1947 78 t. RCA VICTOR 20-2204 (US) . Rubber Neck Blues / Who's Calling You Sweetheart? 02/1949 78 t. RCA VICTOR 21-0019 (US) . 08/1950 SP RCA VICTOR 48-0361 (US) . Charlie MONROE & His KENTUCKY PARDNERS - So Blue / Without Me, Are You Blue? 09/1956 SP DECCA 9-30048 (US) . That's What I Like About You / Why Did You Say Good-Bye?